Karen Fox was appointed the athletic trainer at Notre Dame in 2009. 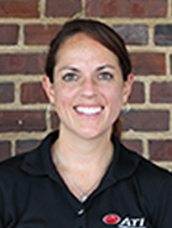 She earned her bachelor's degree in athletic training from East Stroudsburg University in 2005 and her Master's Degree in exercise physiology from the University of Delaware in 2007. At Delaware, she worked as a graduate assistant athletic trainer with Division I athletes from 2005 to 2007. Since then, she has worked with many schools and organizations, such as Villanova Girls Soccer Camps, AAU Girls Basketball, Beast of the East Wrestling Tournament, Diamond State Classic Basketball Tournament, Country Day School of the Sacred Heart, the Kirkwood Soccer Club, and Mount Pleasant High School. Karen has worked for PRO, an ATI Physical Therapy Company, since 2007. Please feel free to contact her with any questions or concerns you may have regarding the care of your student athlete. Her cell phone is the best way to get a hold of her. She is located in the Springfield office of ATI Physical Therapy for 20 hours a week. If you are unable to get a hold of her on her cell phone, you can reach her at ATI. If you are in need of physical therapy, Karen our athletic trainer can get you an appointment at ATI Physical Therapy. Click here to reach the ATI website so you can become more informed with the company and their policies. If insurance is an issue, or if your doctor has given you specific directions due to your insurance, ATI’s policy is to treat everyone fairly and equally, regardless of insurance type. For more information click here. If your child gets injured and you want a second opinion without seeing a doctor, ATI offers FREE injury screens at all of their locations. Please speak to Karen Fox our Athletic Trainer for help setting up an appointment for a screen, or click here for more information. The Notre Dame Athletic Department in conjunction with ATI Physical Therapy has made concussion prevention and management our top priority, to read more about our Concussion Management Plan for Athletes click here. At the beginning of each sports season, the athletic trainer administers a baseline concussion test called the ImPACT Test. The test is done to establish the athlete’s cognitive function at rest, before a concussion occurs. If a concussion is sustained, the athlete can take the test again to see when his or her symptoms return to normal. This test helps return athlete’s to the playing field safely and efficiently. Click here to find a full list of Concussion Specialists in the area. Click here to meet the Notre Dame team doctor.